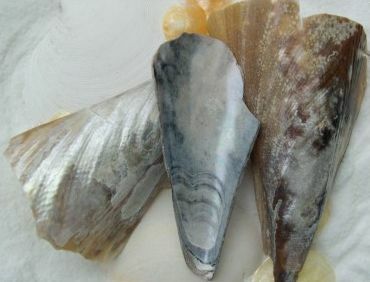 Pen shells (family Pinnidae) are usually gray or brown in color with an iridescent sheen. They are long and tapered in a triangular shape and most of the ones I’ve seen were on the east coast beaches in Florida. They can be huge! My resource book says up to thirty-one inches in length! But many are found broken since they are a bit more fragile than an ordinary seashell. The varieties found in Florida include the Saw-toothed pen shell, Stiff pen shell and Amber pen shell. The ones pictured here (photo by me) look like saw-toothed as they are smoother than the Stiff pen shell which has ridges with spines. Amber pen shells are lighter in color (hence the name). Flag pen shells are wide and rounded on top and are found in the Indio-Pacific region. 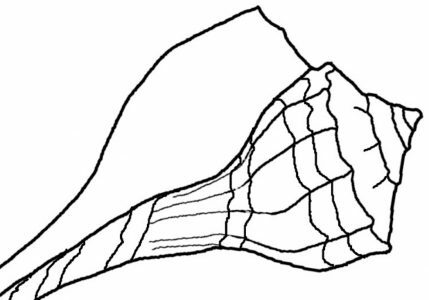 The Noble Pen Shell (Pinna nobilis) has an unlikely history. It’s byssal threads (which anchor the shell in the sand when alive) were once used to make fabric. The threads were woven together to make what was known as “sea silk”. This large shell is found in the Mediterranean region and is in danger of extinction due to over use, pollution and decline in places for it to survive.